Have you ever noticed the dot between the four-point navigation tool and the zoom slider? t’s easy to miss! If you click that button while using Firefox or Google Chrome and, through the magic of the geolocation process, Google Maps for Mobile can tell you roughly where you are from your phone, even if you don’t have GPS tracking system. Google put together a video that explains how this works. It’s convenient when you’re in an unfamiliar place and don’t have the best sense of direction. If you’re searching for a certain place—a street name, a business, or other landmark—you can click on a marker and hit the “Search nearby” link to find coffee, gas, banks, or whatever else you need. What if you don’t have a place to pin down, but want to generally browse an area? Right click anywhere on a Google map, click “What’s Nearby?” in the box that pops up, and Google will create a pin based on a rough street address estimate, or with precise GPS tracking location coordinates. From there, you can click on “Search Nearby” in the box that appears in the left-hand pane, and search around without worrying about specifics. Maps doesn’t get everything right every time. 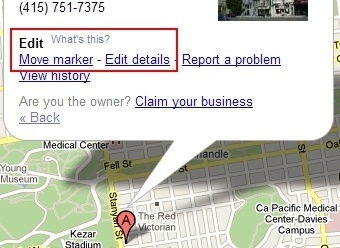 If Maps has a marker that’s off, a wrong number, or a dead web site listed, you can sometimes fix it yourself. Click the pin for an address, hit the link for “More,” and select “Edit Details.” It won’t work on businesses that have “claimed” their listing through the Local Business Center, and there are limits on what you can move, but if you know a pointer is just fundamentally wrong, there’s a fix for that. You can also simply report a problem if you’re unable to actually edit the wrong information. When you’re lost and out of mobile internet territory, that’s when directions are probably a really helpful thing. If you can still receive an SMS message, you can text GOOGLE with a message formatted as “Directions A to B,” substituting a town, ZIP code, or street address for A and B. Google will generate and send you the same directions it would provide via Maps. This one definitely come in handy on your next road trip with your friends or spouse.